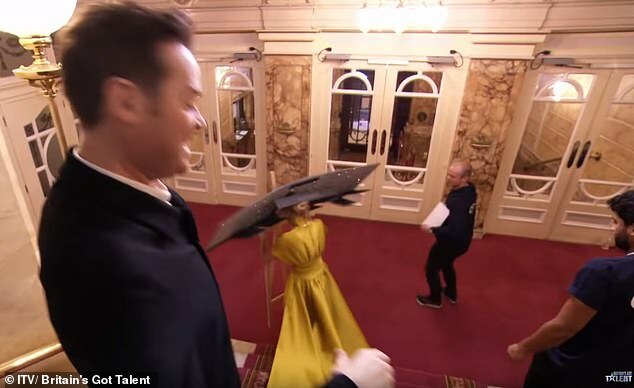 Viewers will see footage of Amanda Holden involved in a comical accident on Saturday night’s episode of Britain’s Got More Talent. 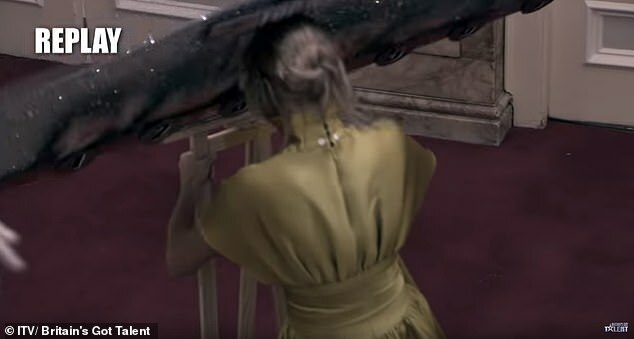 In an exclusive clip, the blonde actress is taken by surprise when a game prop hits her in the face during a behind the scenes segment. 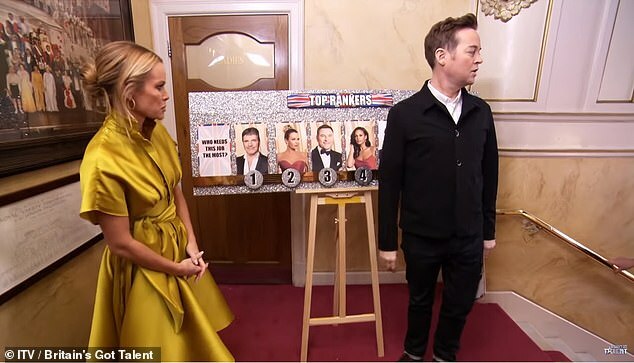 The 48-year-old judge is seen in the clip playing a game named Top Rankers with funnyman Stephen Mulhern. The aim of the game is to rate her fellow judges and hosts in order – on different things such as who needs the job the most and who is the funniest. As Amanda and Steven are about to start the game a crew member shouts out for silence as they begin filming elsewhere at the location. 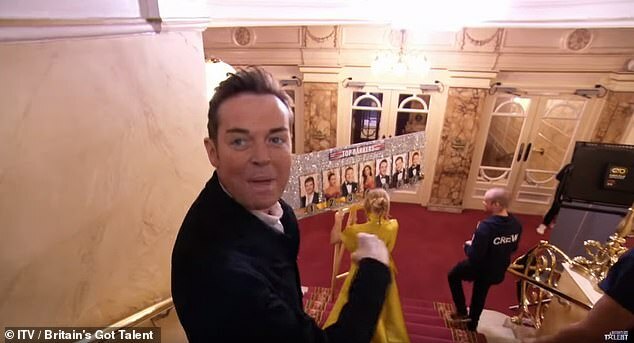 Amanda suggests to Stephen that they should move downstairs to which she grabs the easel that is balancing the glittery scoreboard complete with photos of the judges and presenters Ant and Dec.
As Stephen turns to the camera to narrate, he informs viewers: ‘Amanda has actually moved the set’ as the scoreboard falls back and ricochets off her head to as she descends the staircase. Proving she was not harmed, she burst out into giggles alongside the crew. There then is a slow motion replay for viewers to get an extra glimpse of the commotion and the exact moment Amanda’s head makes contact with the board. She jibes back: ‘Oh you [expletive]’ as she laughs. Simon Cowell and Alesha Dixon also appear backstage with Steven as they play the game with him. 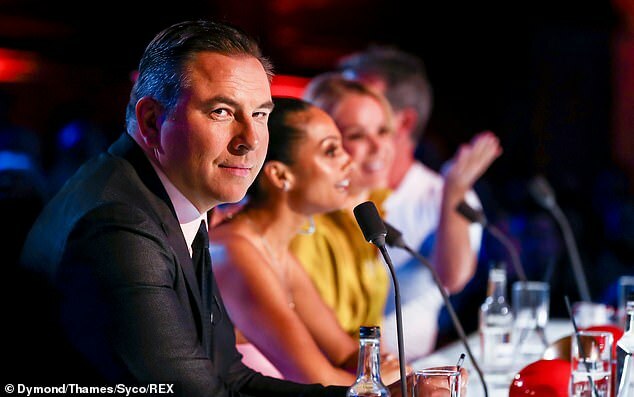 The Britain’s Got Extra Talent host is flattered when Alesha ranks him funnier than duo Ant and Dec.
Last week’s episode saw judges Amanda, Alesha, Simon and David Walliams return to the small screen to look out for best in British talent. Presenters Ant and Dec were also back, with Ant returning after taking some time out of the spotlight following his drink-driving conviction last year. The judges in tears after Flakefleet Children’s Choir performed an exuberant performance of Queen’s Don’t Stop Me Now. After David broke down in tears and pressed his golden buzzer for the children, Ant was also left emotional as one little girl in the group told him ‘I missed you Ant’.